who is the ugliest member of one direction? What bromance do u like better Larry au Niam. which bromance do wewe prefer? Why does Harry win at Quickfire maswali when he's not even playing?And is there a reason why? Do wewe like Larry Stylinson au another bromance more? 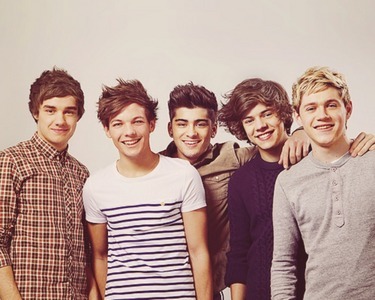 Which Is YOUR inayopendelewa Bromance for 1D?? Harry opened the door and came into Louis house he was unpacking groceries he got from Sainsbury’s. He decided to put his stuff away in a room and go help him. “I got some Mac N Cheese,” Louis said. “Just Mac n Cheese?! What about tacos au sweet corn?!? I couldn’t wait until I got back to Louis’s place! The sleepover was going to be awesome. When I got back nyumbani I started packing. I packed my pink and blue blanket set me and Louis have. I packed the first season of Misfits one of his inayopendelewa shows! I also brought my dhahabu thong, my lucky green boxers and my kazoo. I think I was finally ready to head over to Louis. Maybe we could even make a Twitcam video for the mashabiki to watch. This is going to best sleepover with Louis yet!!! It was a normal siku in the Tomlinson household. Louis was hanging with his girlfriend, Eleanor Calder. Since the band was not touring at the moment he had some free time to do whatever he wanted. Eleanor and Louis were on the kitanda watching upendo Actually, but that wasn’t where their focus was. They were snuggling on the kitanda talking to each other in a cute couple way. “I’m just glad we got the place to ourselves,” she said. WELL Rio Ferdinand has hardly made a secret of his upendo for One Direction in the past – but now the footballer has taken his fanatic feelings that one step further. Rio Ferdinand initially met the One Direction lads when they came to his clothing line launch at London’s Selfridges department store last November. a comment was made to the poll: who is the ugliest member of one direction? an answer was added to this question: Which Is YOUR Favorite Bromance for 1D?? a reply was made to the forum post: what is your favourite bromance? How many vitabu do one direction have out? what is your favourite bromance? ATTENTION ALL LOS ANGELES AREA DIRECTIONERS!! !